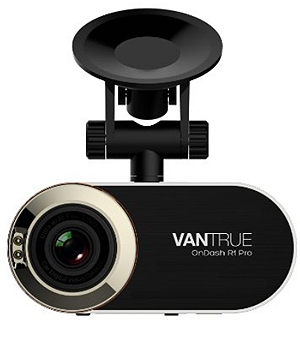 The Vantrue R1 Pro dash cam features extremely sensitive sensor and high quality lens to give you crystal clear videos. It is the upgraded version of Vantrue R1 with higher resolution and image quality. The camera starts recording as soon as you turn on your car ignition, allowing you to drive safely without any fear of loss of footage. Super Clear Recording: This is a 170 degrees wide angle camera with high end Ambarella A7L50 + OV4689 lens that records 1920×1080, 2304×1296, and 2560×1080 HD videos at 30fps. The HDR technology further adds to the clarity of the images; street signs and license plates are clearly visible in the recording. Sound recording too is clear since the camera has in-built microphone and speaker for noise reduction. Night Vision: There are two supplementary lights (LED) to improve the quality of recording during night time and dark hours. Auto Recording: Once the power is turned on, recording starts automatically on a seamless loop. There is a sensor to detect any impact; the important clips of the video are automatically locked to prevent deletion. The camera can detect any motion or movement up to a distance of 30ft and automatically record it. Parking Monitor: The G-Sensor monitors your vehicle even when parked; it automatically triggers recording whenever it senses some jostle. 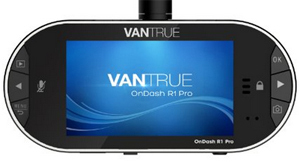 LCD Display: Vantrue OnDash comes with 2.7 inches TFT LCD screen that can play back both image as well as video files. The timeout function ensures the display is automatically turned off after a set period of time after the recording begins; this prevents unnecessary distraction on your vehicle’s windshield. High on Safety: Once the memory card runs out of capacity, the camera automatically begins overwriting the oldest recording; this is facilitated by the seamless loop recording feature. The G-sensor in the camera can automatically detect any accident, lock the video file and send it to the “event” folder. Easy setup: Just attach the camera to the windshield using the suction cup it comes with. Plug it into a power source using the accompanying 11.8 ft USB power cable. Working temperature: -4 to 158 oF (-20 to 70 oC). 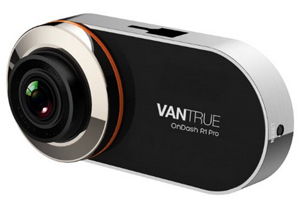 The Vantrue R1 Pro dashcam looks stylish and has good audio/video quality. Buttons are easily accessible and the user manual is quite detailed. You can use the camera button to take quick snapshots (16M pixels). The 2.7 inches LCD is good enough to capture and small enough to be unobtrusive. Expandable storage of 64 GB makes for a sizeable recording, given the fact that a 3-minute video clip takes about 450 MB of space.